Almost a year ago, former BiH Presidency Chairman, Bakir Izetbegović, stated that the Federation BiH has developed a military industry and that statement triggered various reactions, especially in Republika Srpska. “We will make a moving howitzer, we have already made a rifle, we will launch production of drones, round up the production of each type of ammunition. We will do it for the market, but also ‘just in case'”, Izetbegović said. The true is that several factories in that Bosnia and Herzegovina entity are working on the production of various types of weapons. The majority of it are being exported, which means that the weapons produced in BiH can be found in various parts of the world, on various battlefields. According to official figures, BiH in 2018 exported more than 5 360 tons of various weapons, ammunition and parts for weapons. The total income of all factories of this type in the state was BAM 205 million (about EUR 102.5 million) but these figures are not devided by entities, Federation BiH and Republika Srpska. The biggest amount of weapon was exported to Saudi Arabia, Turkey, Afghanistan, Egypt, US, Bulgaria, Croatia, Serbia etc. Recently, Republika Srpska also announced that it produces weapons, but not in the quantities that Federation BiH is making. 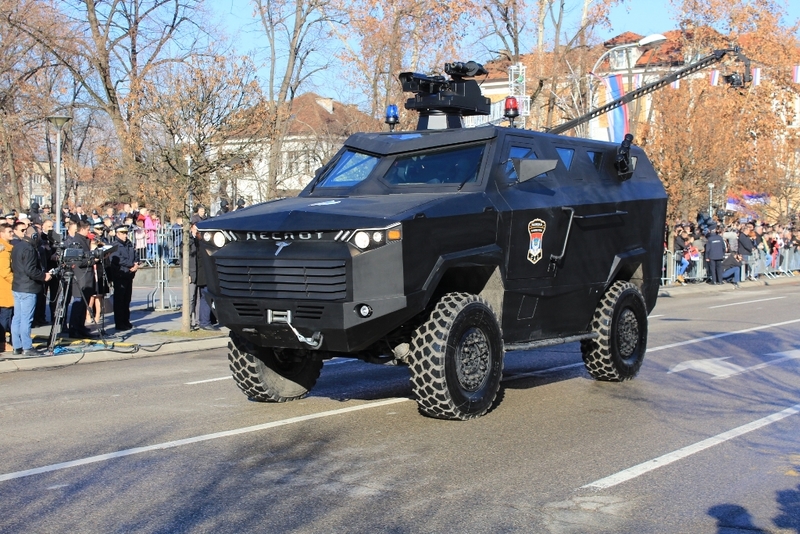 On the Republika Srpska parade, January 9, in Banja Luka, the public was able to see the DESPOT multipurpose vehicle, produced in the Technical Overhaul Bratunac (TRB). It was announced that the DESPOT is still in the developing phase but factory management is convinced that the vehicle will attract the attention on the International Defence Exhibition and Conference in Abu Dhabi on February 17. Unofficially, at the same exhibition the TRB will present the pistol, the so-called “Vampire”, which TRB’s engineers have been perfecting for several years. “The pistol has everything the modern weapon needs to have; design and precision. Its capability is to fire 100,000 bullets”, the constructor of project “RS9” Vladimir Popović told the media. Despite both of them, DESPOT and Vampire, being still “half secret projects”, according to officials, there is already great interest from foreign countries for the TRB products. A new factory will open soon and the new plant will employ 50 new workers. During a recent visit of the Minister of Economy and Entrepreneurship of Republika Srpska, Vjekoslav Petričević, TRB Executive Director Marko Mrkajić said that in the last four years, ten million BAM (about five million euro) has been invested in production in this company, all legacy debts to workers have been repaid and salaries are being paid regularly. “Technical Overhaul employs 200 workers and in the first half of this year there are plans to open a new plant where 50 more workers will be employed”, Mrkajić said.